Analysis: The move means little in regards to the severity of Holmes' left high-ankle sprain except that he would have been ruled out for Sunday's season finale against the Chargers. The 30-year-old may need some time to make a full recovery, but he should be ready for offseason OTAs in the spring. Analysis: Holmes' inability to practice for the second straight day adds further credence to the report Mike Klis of 9News Denver issued Wednesday, wherein the wideout was revealed to be dealing with a high-ankle sprain that will likely keep him sidelined for the season finale against the Chargers. The Broncos will officially reveal Holmes' odds of playing in that contest or rule him out entirely when the team releases its final practice report Friday. Analysis: Holmes isn't a significant part of the Denver passing game, but his likely absence for Week 17 represents yet another blow to a decimated receiver room that has already lost Emmanuel Sanders (Achilles) and Demaryius Thomas (traded to the Texans) for the season. With Holmes out of the mix for Sunday, River Cracraft is in line to serve as the Broncos' No. 4 wideout. Analysis: Holmes was spotted limping in the locker room following Monday's game against Oakland. He was unable to log any counting stats during the Week 16 loss. Holmes caught his only target for a five-yard gain during Saturday's 17-16 loss to Cleveland. The Broncos claimed Holmes off waivers Wednesday, Zac Stevens of BSNDenver.com reports. Analysis: Holmes didn't take long to land elsewhere after the Bills waived him and fellow wideout Kelvin Benjamin a day earlier. The veteran will give the Broncos some added depth and experience in the wake of top receiver Emmanuel Sanders sustaining a torn Achilles' tendon during Wednesday's practice, which will likely spell an end to his season. Beyond Holmes, the team's other healthy options at the position are Courtland Sutton, DaeSean Hamilton, Tim Patrick and River Cracraft. The Bills have released Holmes. Analysis: The team also released Kelvin Benjamin on Tuesday, with the moves thinning out the Bills' wideout depth, but paving the way for younger and faster players to get more snaps. In 12 games this season, Holmes caught 12 passes for 157 yards. At 6-foot-4, 210 pounds, the 30-year-old brings good size to the table, but it's still hard to imagine him suddenly emerging as a red-zone threat down the stretch, even if he catches on with a new team in short order. Holmes caught his lone target for 21 yards during Sunday's 41-10 win over the Jets. 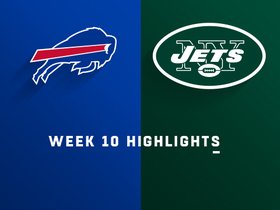 Analysis: Sunday was far and away Buffalo's biggest offensive outpouring of the season, but it didn't do much for Holmes, who has now caught one or no passes in five of his last six games. The statuesque target remains a good deep threat who might have the advantage of catching passes from big-armed rookie Josh Allen (elbow) following the bye. That's where the good news ends. Week 12 brings a Jacksonville defense giving up just 201 passing yards per game, the best in the league. Holmes (neck) is active for Sunday's contest against the Jets. Analysis: Holmes was a full participant at practice Thursday and Friday, so his active status isn't very surprising. He'll likely see his usual role as a depth wideout for Buffalo. Holmes (neck) is questionable for Sunday's game against the Jets. Analysis: Holmes began the week as a limited practice participant but put in full sessions Thursday and Friday, so he would appear on track to play Sunday. The 30-year-old has more than two receptions in only one game this season and should take up his usual depth role in the Bills' struggling passing game. Holmes (neck) was a full participant in Thursday's practice. Analysis: Holmes only practiced on a limited basis Wednesday, but was able to shake that tag and log a full practice Thursday. As evidenced by this news, all signs point to Holmes suiting up in Week 10. The 30-year-old hasn't made a big impact on offense thus far, so it's possible he'll still be limited to a depth role in the passing game to go along with special-teams work. Holmes was limited during Wednesday's practice session due to a neck injury. Analysis: Holmes hasn't totaled more than 45 receiving yards in any game this season, nor has he found his way into the end zone. While he'll probably shake off the next issue to play Week 10 against the Jets, he'll be limited to a depth role in the passing game to go along with special-teams work. Holmes caught his lone target for a 6-yard gain during Sunday's 41-9 loss to Chicago. Analysis: Holmes has now been held to one or no catches in four of five games. 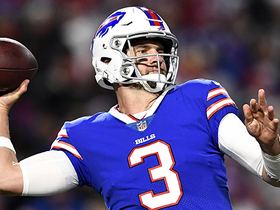 Sunday was another day of folly for Buffalo's passing offense with another three interceptions from Nathan Peterman. Maybe we'll see the return of Derek Anderson (concussion) against the Jets Sunday, but given New York's top-five defense in terms of opponent passer rating, that probably won't matter for Buffalo's targets like Holmes. Holmes caught two of three targets for 45 yards during Monday's 25-6 loss to the Patriots. 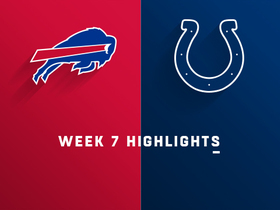 Holmes caught one of two targets for 13 yards during Sunday's 37-5 loss to the Colts. Analysis: Holmes has not caught multiple passes in a game since Week 4 and is still waiting to top 30 yards in a game or find the end zone. The Patriots' bottom-10 pass defense looks to be a potential cure Sunday, but believing that would require you to look beyond Buffalo's carousel of horrors at quarterback. Derek Anderson, who turned the ball over four times against Indianapolis in his Bills debut, is penciled in to start once again. Holmes caught one of two targets for 20 yards during Sunday's 20-13 loss to Houston. 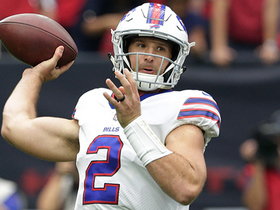 Analysis: Holmes has now caught one or no passes in four of six games and with Josh Allen (elbow) out for at least a few weeks and either newcomer Derek Anderson or turnover machine Nathan Peterman taking his place, things don't look likely to improve. The good news is that a relatively friendly matchup against Indianapolis' bottom-third pass defense awaits Sunday. Holmes caught two of three targets for eight yards during Sunday's 22-0 loss to Green Bay. Holmes was targeted four times during Sunday's loss to the Chargers but did not catch a pass. 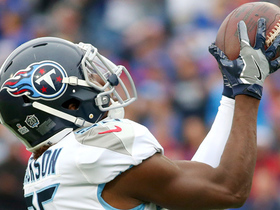 Analysis: The veteran has just one catch for 14 yards through two games. Holmes essentially served as the third wideout Sunday, seeing 58 percent of the offensive snaps with the Bills only using four active receivers. His height and athleticism will get him into the end zone occasionally -- he's had three or more scores each of the last four seasons -- but Holmes remains an unappealing fantasy option in an unappealing offense. Holmes (quadriceps) was seen practicing in full pads Sunday, Joe Buscaglia of WKBW.com reports. Analysis: Holmes has been sidelined since Thursday while nursing a quadriceps injury, but coach Sean McDermott never expressed much concern regarding the wideout's health. Holmes is expected to play a depth role in the Bills' receiving corps this season. 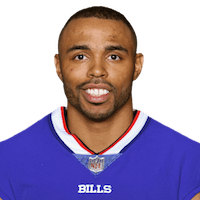 Holmes (quad) missed practice for the second straight day Friday, Mitchell Courtney of the Bills' official site reports. Analysis: Coach Sean McDermott didn't go into specifics, but also indicated Holmes may not be out much longer. 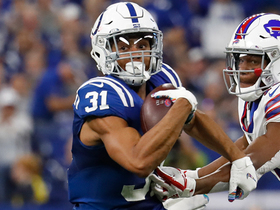 The veteran is vying for a depth receiver role after surprisingly leading the Bills in touchdown catches last season with a modest total of three. Holmes was absent from Thursday's practice due to a quadriceps injury, Sal Capaccio of WGR Sports Radio 550 reports. Analysis: There haven't been any prior reports that Holmes is dealing with a particularly worrisome injury, so the Bills may just be exercising caution with a veteran in the early days of training camp. Holmes is expected to return to the practice field within a few days and continue to stake his claim to a depth role in the Bills' passing attack this season. Holmes (neck) participated with the first-team offense at mandatory minicamp this week, Chris Brown of the Bills' official site reports. The Bills placed Holmes (neck) on injured reserve Tuesday, Joe Buscaglia of WKBW.com reports. Holmes (neck) won't practice Friday and has been ruled out for Sunday's game against the Patriots, Mike Rodak of ESPN.com reports. Analysis: Given that Holmes is a low-volume option in a modest passing offense, his absence in Week 16 is more of a hit to the Bills' depth at wideout than it is to fantasy players. Assuming Kelvin Benjamin (knee) plays Sunday, he'll head the Bills wideout corps this weekend along with Zay Jones and Deonte Thompson. Holmes (neck) remained sidelined at Thursday's practice. Analysis: Holmes hasn't caught more than one pass since Week 8 and none of his three TDs this season have come since then. As a low-volume option in a modest passing offense, he's not on the fantasy radar as Sunday's game against the Patriots approaches. Holmes (neck) isn't practicing Wednesday, Chris Brown of the Bills' official site reports. Analysis: Holmes battled a stiff neck last week and missed one practice as a result, but ultimately received clearance to play in Sunday's 24-16 win over the Dolphins. With the wideout experiencing no reported setbacks in that contest, it's possible that his absence from Wednesday's session is just for precautionary purposes while he continues to nurse some minor soreness. Holmes (neck) doesn't carry an injury designation for Sunday's game against the Dolphins after practicing fully Friday. Analysis: Holmes isn't a high-volume option in the Buffalo offense, though the 6-foot-4 wideout does earn the occasional red-zone target. Even with fellow big-bodied wideout Kelvin Benjamin still dealing with a knee issue that has him listed as questionable for Sunday's contest, Holmes isn't a high-percentage fantasy option, given how touchdown-dependent his value tends to be. Holmes, who missed Wednesday's practice after waking up with a neck problem, is back on the field Thursday, Chris Brown of the Bills' official site reports. 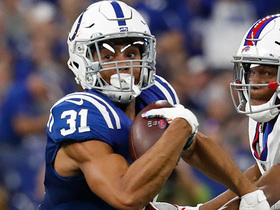 Analysis: It looks like Holmes will be out there for Sunday's crucial game against the Dolphins, but he's well down the pecking order as the fifth or sixth option in the passing game. Other than a a 3-51-1 outing in Week 7, Holmes hasn't posted more than two catches or 18 yards in any other game this season. Bills head coach Sean McDermott said Holmes won't practice Wednesday due to a stiff neck, Chris Brown of the Bills' official site reports. 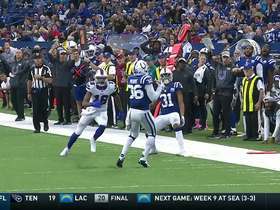 Analysis: Holmes likely picked up the injury in the Bills' 13-7 overtime victory over the Colts on Sunday. If the wideout is able to put in at least a limited practice Thursday or Friday, he'll likely gain clearance to suit up Week 15 against the Dolphins, but don't expect Holmes to hold a major role in the Bills' passing attack. He's been targeted just four times over the Bills' last five games, making one reception for seven yards. Holmes caught one of three targets for seven yards in Sunday's 54-24 loss to the Chargers. Holmes only saw nine offensive snaps in Sunday's loss to the Saints while not receiving a single target. 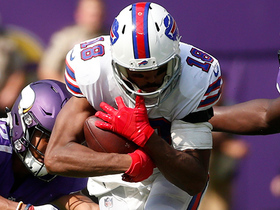 Analysis: Even with rookie Zay Jones out with an ankle injury, Holmes is at best serving as a No. 4 receiver behind newcomer Kelvin Benjamin, Jordan Matthews and Deonte Thompson. There was actually a chance the Bills would cut Holmes last week, as a combination of releases to fringe players would have netted the team a third-rounder based on offseason activity. In the end, the Bills decided they like what they have and will stick with the veteran Holmes as a depth receiver. Holmes' new teammate Kelvin Benjamin, acquired in a trade with the Panthers on Tuesday, will not make his team debut Thursday against the Jets, Adam Schefter of ESPN reports via a source. Analysis: While the two starting spots will likely go to Jordan Matthews and rookie Zay Jones, Holmes has been sprinkled in all season and does lead the team with three TD catches. While we wouldn't advocate using him unless you're in some crazy deep league -- Holmes only has 97 receiving yards all season -- he probably is the best bet to catch a red-zone TD until the hulking Benjamin gets up to speed. 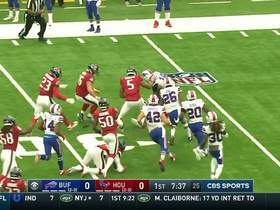 Buffalo Bills QB Josh Allen connects with wide receiver Andre Holmes for a big 22-yard catch and run.